The umbrella term “Islamic art” casts a pretty big shadow, covering several continents and more than a dozen centuries. So to make sense of it, we first have to first break it down into parts. One way is by medium—say, ceramics or architecture—but this method of categorization would entail looking at works that span three continents. Geography is another means of organization, but modern political boundaries rarely match the borders of past Islamic states. A common solution is to consider instead, the historical caliphates (the states ruled by those who claimed legitimate Islamic rule) or dynasties. Though these distinctions are helpful, it is important to bear in mind that these are not discrete groups that produced one particular style of artwork. Artists throughout the centuries have been affected by the exchange of goods and ideas and have been influenced by one another. Four leaders, known as the Rightly Guided Caliphs, continued the spread of Islam immediately following the death of the Prophet. 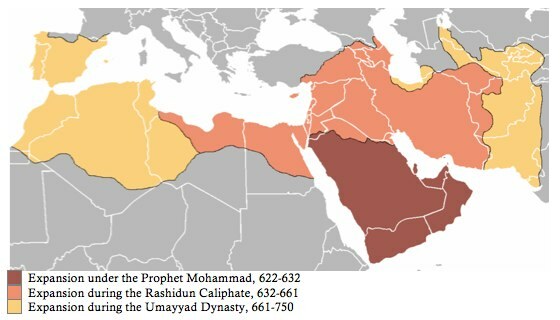 It was following the death of the fourth caliph that Mu’awiya seized power and established the Umayyad caliphate, the first Islamic dynasty. During this period, Damascus became the capital and the empire expanded West and East. The first years following the death of Muhammad were, of course, formative for the religion and its artwork. The immediate needs of the religion included places to worship (mosques) and holy books (Korans) to convey the word of God. So, naturally, many of the first artistic projects included ornamented mosques where the faithful could gather and Korans with beautiful calligraphy. Because Islam was still a very new religion, it had no artistic vocabulary of its own, and its earliest work was heavily influenced by older styles in the region. Chief among these sources were the Coptic tradition of present-day Egypt and Syria, with its scrolling vines and geometric motifs, Sassanian metalwork and crafts from what is now Iraq with their rhythmic, sometimes abstracted qualities, and naturalistic Byzantine mosaics depicting animals and plants. These elements can be seen in the earliest significant work from the Umayyad period, the most important of which is the Dome of the Rock in Jerusalem. This stunning monument incorporates Coptic, Sassanian, and Byzantine elements in its decorative program and remains a masterpiece of Islamic architecture to this day. Remarkably, just one generation after the religion’s inception, Islamic civilization had produced a magnificent, if singular, monument. 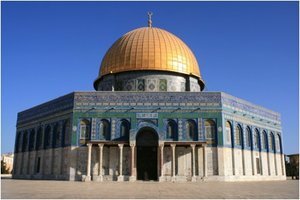 While the Dome of the Rock is considered an influential work, it bears little resemblance to the multitude of mosques created throughout the rest of the caliphate. It is important to point out that the Dome of the Rock is not a mosque. A more common plan, based on the house of the Prophet, was used for the vast majority of mosques throughout the Arab peninsula and the Maghreb. Perhaps the most remarkable of these is the Great Mosque of Córdoba (784-786) in Spain, which, like the Dome of the Rock, demonstrates an integration of the styles of the existing culture in which it was created. The Abbasid revolution in the mid-eighth century ended the Umayyad dynasty, resulted in the massacre of the Umayyad caliphs (a single caliph escaped to Spain, prolonging Umayyad work after dynasty) and established the Abbasid dynasty in 750. The new caliphate shifted its attention eastward and established cultural and commercial capitals at Baghdad and Samarra. 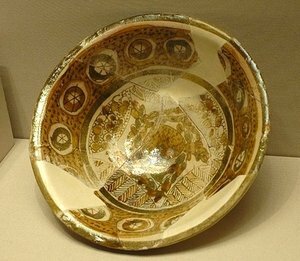 The Umayyad dynasty produced little of what we would consider decorative arts (like pottery, glass, metalwork), but under the Abbasid dynasty production of decorative stone, wood and ceramic objects flourished. Artisans in Samarra developed a new method for carving surfaces that allowed for curved, vegetal forms (called arabesques) which became widely adopted. There were also developments in ceramic decoration. The use of luster painting (which gives ceramic ware a metallic sheen) became popular in surrounding regions and was extensively used on tile for centuries. 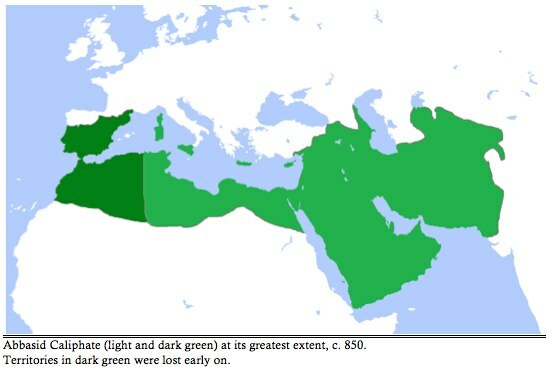 Overall, the Abbasid epoch was an important transitional period that disseminated styles and techniques to distant Islamic lands. The Abbasid empire weakened with the establishment and growing power of semi-autonomous dynasties throughout the region, until Baghdad was finally overthrown in 1258. This dissolution signified not only the end of a dynasty, but marked the last time that the Arab-Muslim empire would be united as one entity. Cite this page as: Glenna Barlow, "Arts of the Islamic world: The early period," in Smarthistory, August 8, 2015, accessed April 24, 2019, https://smarthistory.org/arts-of-the-islamic-world-the-early-period/.